At some point, you just have to know when to quit and for Soul Fly Outfitters we logged our final day of guiding in 2017 on October 18th. The fall brings a lot of feeling for anglers in the Northeast... an impending period at the end of a salty run on sentence, cooler temps, and migrating everything. Shorter days are on the horizon and the threat of snow increases as each day passes. I personally love the seasons and the shifts that are born as a result. It's a pulse that we can all tap into as we look to the water, woods and sky for signs. You can smell it in the air and hear the whisper through the trees. As a chapter closes I find myself reflecting, feeling deep gratitude and stoking a fire that drives me to continue to evolve as a guide and human being. Tyler Milam, a repeat Soul Fly customer and friend, stepped on my skiff the morning of the 18th to hopeful expectations that the season would end with a bang. The conditions were right, the tide was fat, and the moon was new. Tyler was gunning for a new personal best striper and I was commited to doing all I could to make it happen. Expectations can be a tricky piece to manage as a fishing guide but I told Tyler we'd do our best and hopefully mother nature would cooperate. 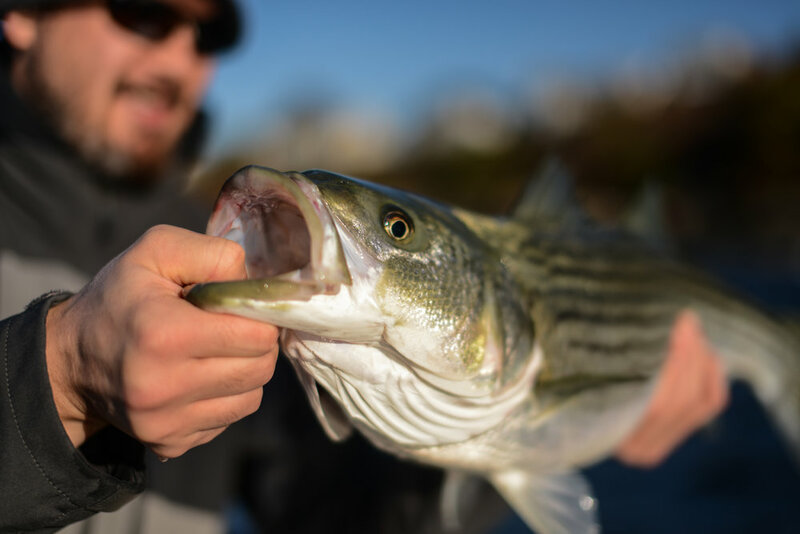 For Soul Fly, October had been characterized by exclusively fishing the coast, tossing flies to the rocks, and looking for schools of big bass migrating south. We'd run into giant Bluefin Tuna, under the boat and airborne, Minke Whales, Harbor Porpoises, and acres of Menhaden. The cry of Gannets filled the air and gave hopes of big bass beneath. We'd been lucky enough to intersect with several schools of big bass heading south in October so everyday we roll the dice in hopes of fall magic. As we hit the coast at sunrise the vibe was good. Birds in the air and top water action around. Small bass hugged the corner of a point and offered entertainment right out of the gate. We fished a section of coast that has magnetic qualities for big fish and found a small pod of cows on the last 100 feet of our drift before we had planned to move locations. Tyler tossed his flatwing where a cove transitioned into a point. We saw 4 or 5 big, fat stripers move for the fly in about ten feet of water. The fly disappeared and Tyler went tight. She was a heavy girl with a stomach on her to prove it. She fought like she had fed all night, tugging on the fly line lazy and deep. Tyler got the fish to the boat and was ecstatic... his new personal best and a great fish to cap his season. The fish probably measured in the low 30" range and maybe weighed 12 to 13 pounds, a great fly rod fish... any day. We found more resident fish throughout the day and the wind continued to settle to almost dead calm. We had aggressive eats over rocky reefs, found pods of porpoises, and tight schools of mackerel just about everywhere we turned. We both couldn't have asked for more on the final day of the guide season. Fish are still around, distracting me from overdue chores at the house. It's hard to turn down the serenity of running the coast this time of year, it feels like your own personal playground with the exception of hard working lobsterman patrolling the waters. New challenges and opportunities are ahead for the winter months and a Soul Fly hosted trip to Abaco Lodge in the Bahamas (Feb, 2018) will provide some much needed therapy during the depth of our winter. Thank you to everyone that helped make this season a success for Soul Fly Outfitters. It's been an unforgettable year with old friends and lots of new ones. We've made memories and future promises committing us to fishy times ahead. Thank you, thank you, everyone. Enjoy your next chapter and take a peek at some highlights from 2017 below.